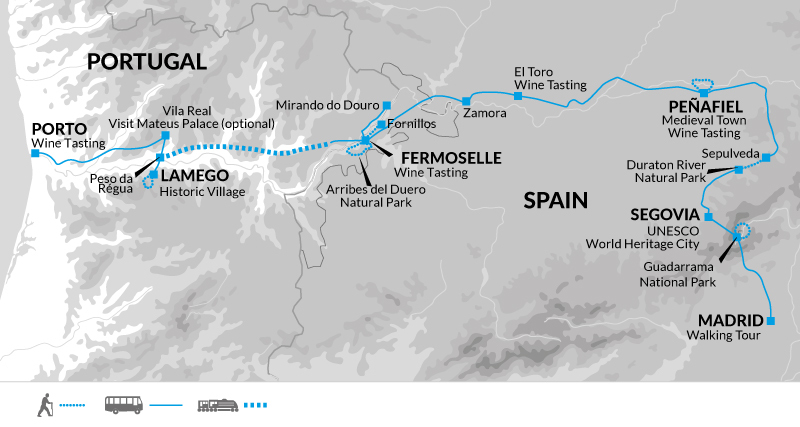 Ideal for those who enjoy wine, culture and countryside walks this fascinating journey from Madrid to Porto ventures through the Ribera del Duero region of Spain and the Douro winelands of Portugal. Sample regional vintages, explore national parks and stay in beautiful medieval towns. Join trip at the hotel in Madrid. The rest of the day is free to relax or see some of the city. This morning we head out for an orientation walk of Spain's busy capital city and the third largest city in the European Union after London and Berlin. Located on the Manzanares River, Madrid has its share of historic sights, great architecture, nightlife, fine dining, culture and shopping. The afternoon is left free to enjoy this lively capital. This morning we leave Madrid behind as we head north to Segovia. After an hour and and a quarter we arrive at the village of Manzanares el Real, and the start of our walk into the Guaderrama National Park. This area of natural beauty is best known for the unusual granite rock formations of La Pedriza. Vegetation is sparse, however for rock-climbers it is a haven, as well as being a breeding colony for Griffon Vultures, which with a bit of luck we will spot on our walk. We continue by road for another hour until we reach the stunning UNESCO world heritage historic city of Segovia, with its huge 1st century Roman Aqueduct and Disney-like Alcazar Fortress. We have free time to explore on arrival. Today's 10 kilometre walk is expected to take around three hours with 300 metres of ascent and descent. Late morning we drive around forty-five minutes to the spectacular limestone canyon lands of Duraton River Natural Park, and take a walk along the gorge to the charming medieval town of Sepulveda. We continue on to Penafiel, right it in the heart of the Ribera de Deuro wine region. The Ribera de Deuro is one of several recognized wine producing regions along the Duero River. The region produces red wine from the Tempranillo grape. 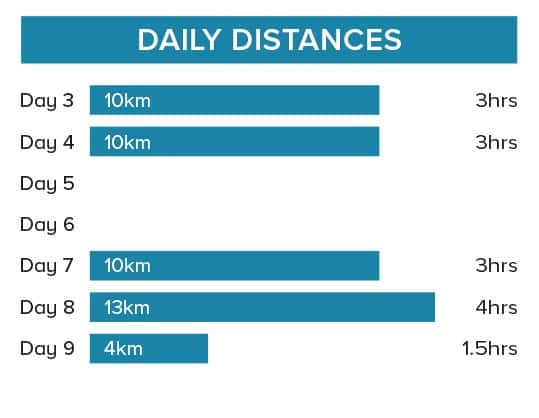 Today's 10 kilometre walk is expected to take around three hours with 100 metres of ascent and descent. This morning has been left free in Penafiel for time to stroll through the medieval town centre with its square once used for bullfights or walk up to the Penafiel Castle. The land under the town is full of excavated caves traditionally used to store wine. You will be able to spot the chimney vents that dot the landscape. In the afternoon we enjoy a wine tasting at the Protos Bodega, one of Spain's most innovative wineries. This morning we drive around an hour and a half hour to El Toro in the province of Zamora, another top notch wine producing region on the Duero River. We will stop for wine tasting in the village, before continuing on to the city of Zamora for lunchtime. This delightful city is a real architectural gem and home to the most Romanesque churches in Europe. In the afternoon we will continue on the Portuguese border, to our home for the next three nights - the medieval hilltop village of Fermoselle, right in the heart of the Arribes del Duero Natural Park. Fermoselle dates back to pre-Roman times and with its own micro-climate, a landscape similar to that of Tuscany in Italy, its narrow cobbled streets, rustic stone houses and, most importantly, delicious wines - it is a very pleasant place to stay! This morning we head into the Arribes del Duero Natural Park for a walk through its spectacular countryside. This afternoon we have a wine tasting in a local bodega, dug into the rock - one of around 900 granite bodega caves dating back to ancient times when wine production was large scale business in the area. Today's 10 kilometre walk is expected to take around three hours with 250 metres of ascent and descent. After breakfast we walk from the village through woodland and oak forest to the small village of Fornillos, where we have the opportunity to try local farmhouse cheese. We then drive to Miranda do Douro in Portugal for a walk around the historic centre.There is the option to take an hour boat trip into the spectacular gorge of the Duero River. Afterwards we drive back to Fermoselle. Today's 13 kilometre walk is expected to take around four hours with 150 metres of ascent and descent. Today we drive two hours into Portugal, to the village of Pocinhos, from where we board the local train for a two and a half hour journey along the Douro Valley to Peso da Regua. A short taxi ride uphill then brings us to the beautiful Renaissance and Baroque village of Lamego. We have time to walk around the historic centre and the option to see the famous Nossa Senhora de Remdios church, before taking a short walk in the surrounding area before dinnertime. Today's urban walk is expected to take around one-and-a-half hours with 150 metres of ascent and descent. Today we drive to Porto via Vila Real, a hilltop town above the confluence of the Corgo and Cabril rivers with a pleasant historical centre. This afternoon in Porto we take an orientation walk in the town centre and enjoy a wine tasting. Today has been left free to enjoy this lovely riverside city and its sights. Porto is Portugal's second largest city after Lisbon, and offers visitors a range of architectural and cultural attractions, such as the Palacio da Bolsa, with its spectacular Alhambra-like interior, a charismatic medieval quarter and the monumental central avenue, Avenida do Aliados. Tour ends after breakfast. If you are staying on there is plenty to see and do, as well as plenty of wine to taste! We recommend you bring walking/hiking boots, make sure that your boots are worn-in and comfortable before the start of the trip. Also trainers or sandals for relaxing and general wear. We suggest that on international flights you either carry your walking boots in your hand luggage or wear them - should your luggage be lost or delayed, your own boots are the one thing that will be irreplaceable. Although entirely voluntary, tipping is a recognized part of life in this region of the world. Some local staff will look to members of the group for personal recognition of particular services provided. In order to make things easier for you, the Explore Leader may organise a group's tips kitty and if this is the case, they will account for it throughout the trip. Accordingly, we recommend approximately 15€ per person for tipping. 10% is recommended at meal times. There are included walks on five days. The walks are between 1.5 to 4 hours and the terrain is gently undulating through woodlands, along boardwalks and cobbled streets. Ideal for those who enjoy wine, culture and easy countryside walks this journey from Madrid to Porto ventures deep into wine country in both Spain and Portugal, getting off the beaten track whilst showcasing a less visited part of Europe.